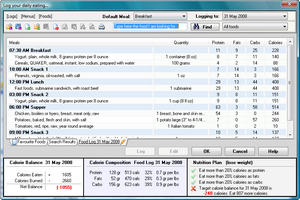 Fitness Assistant is a smart software solution for counting calories, managing bodyweight and tracking exercise. The software features a smart calorie monitoring system that significantly boosts your chances of reaching your target weight on the target date. By actively monitoring how your body responds to your calorie intake, Fitness Assistant calculates your real calorie expenditure and gives you an accurate calorie plan. Reach your weight goals. SMART Calorie Monitoring System learns your metabolism and dramatically boosts your chances of reaching your target weight on the target date. Enjoy a flexible eating lifestyle. Fitness Assistant does not offer ineffective fixed calorie diet plans. You have the absolute freedom to eat more or less than the program tells you and it will automatically correct the calorie plan for the remainder of the goal period. Not just another calorie counter. Fitness Assistant is a diet software program that actively detects changes in your metabolism and gives precise calorie advice that will make your diet successful. Say goodbye to weight loss plateaus caused by inacccurate *average person* calorie estimations and reach your goals on time. Fitness Assistant - "The Smart Diet Software and Fitness Software"
Qweas is providing links to Fitness Assistant Portable 3.3 as a courtesy, and makes no representations regarding Fitness Assistant Portable or any other applications or any information related thereto. Any questions, complaints or claims regarding this application Fitness Assistant Portable 3.3 must be directed to the appropriate software vendor. You may click the publisher link of Fitness Assistant Portable on the top of this page to get more details about the vendor.